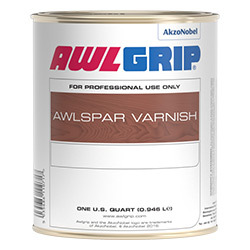 Awlspar was formulated to recreate the highest quality classic spar varnish with state of the art ultraviolet inhibitors and absorbers. It has excellent durability, and is fast dry, fast recoat for quick build up (2-3 coats per day when temperatures are above 75° F). Applied best by brush and is a superior base for AWL-BRITE PLUS. Use T0016 Awlspar reducer to reduce and for tool cleaning. Recommended Wet Film Thickness: 2-3 mils (50-75 microns) per coat. Recommended Dry Film Thickness: 1-11/2 mils (25-37.5 microns) per coat. Recoatability: With itself: 3-4 hours, 36 hours maximum without sanding or scuffing. With AWL-BRITE PLUS: 3 days minimum. Theoretical Coverage: Sq. Feet/Gallon. 700 Sq. Feet at 1 mil dry (25 microns). 70-100 Sq. Feet at recommended total dry film thickness of 7-10 mils. Wood should be clean, dry, smooth, and well seasoned. New Wood Use marine teak cleaner or wood bleach to remove excess oils, promote color uniformity, and adhesion. Thoroughly remove all cleaner and neutralizer residue before proceeding. Rough sawn lumber must recieve heavy sanding to level the grain. Work through the grits to effectively level the grain 60/80 to 100/150 to 220 etc. When the grain is level, smooth sand the surface with 320 grit paper. Old finishes in good condition should be washed with Awl-Prep surface cleaner, then sanded with 220-320 grit paper to remove the gloss. Old finishes in poor condition should be removed. Test on small area to ensure Awlspar does not atack the finish. If the old finish is attacked, it must be completely removed before continuing. After new wood has been sealed, or on previously coated surfaces, apply light smooth, even coats 2-3 mils wet of full bodied material. At temperatures above 75 F, 2 to 3 coats can be applied per day. If sanding is required, allow to cure 24 hrs before sanding. Best results are achieved when surface is sanded smooth with 320-400 grit paper after every 2 - 3 coats. A good system would include 7 - 10 coats. Exact number of coats will vary by applied film thickness and the amount of sanding. Awlspar will cure at temperatures as low as 45 F, however best results are achieved when temperatures are between 60 F and 90 F.
If possible, avoid applying or curing material in direct sunlight. Do not apply to surfaces warmer than 105 F or colder than 45 F. Do not attempt to cure in temperatures below 45 F.